Branch in 1859. Image from the Library of Congress. On September 17, 1862, Gen. Lawrence O’Bryan Branch was shot and killed by a sharpshooter at the Battle of Sharpsburg. 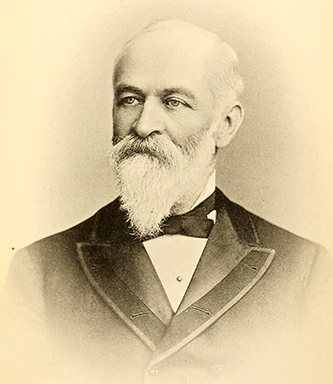 Born in 1820 in Halifax County, Branch was placed in the care of his uncle, U.S. senator and former North Carolina governor John Branch, following the death of both of his parents. After college at UNC and Princeton, Branch moved to Nashville, Tenn., to work as a newspaper editor and to study law. He opened a law practice in Florida and served as an aide to Governor Robert R. Reid during the Seminole War. Branch married on a trip to North Carolina and eventually opened a law practice in Raleigh. He held a number of prominent positions in the decade prior to the Civil War including a term in the U.S. House of Representatives. When North Carolina seceded in 1861, Branch enlisted as a private in the Confederate army, but was soon appointed the state’s Quartermaster General by Governor John W. Ellis. Branch obtained a commission as colonel of the 33rd North Carolina Infantry and was appointed a brigadier general in January 1862. Branch went on to command his brigade at the Battle of New Bern and led the command at the engagements of Hanover Court House, the Seven Days’ Battles, Second Manassas and Sharpsburg. On August 27, 1868, David Lowry Swain, president of the University of North Carolina and former governor, died at age 67. His death was the result of a buggy accident on August 11. Initially buried at his Chapel Hill home, he was later reinterred in Raleigh’s Oakwood Cemetery. A native of Buncombe County, Swain became recognized as an advocate for western interests, internal improvements and progressive government. The General Assembly elected him to his first term as governor in 1832. Swain called for the constitutional convention which met in Raleigh in July 1835, and to him, more than anyone else, belongs the credit for the accomplishments of that meeting, including crucial reforms in the methods of representation and the election of governors by popular vote. In 1835, Swain was elected UNC president and won the respect of both students and faculty for his administrative ability, personality and integrity. Though the state experienced severe hardships during the Civil War, Swain managed to keep the university open. As Sherman’s army approached Raleigh in the spring of 1865, Swain played a role in surrendering the state capital and in securing assurances that the university would not be harmed. On August 19, 1862, a Union force commanded by Colonel Thomas G. Stevenson of the 24th Massachusetts Volunteer Infantry burned the Confederate fort at Huggins’ Island near Swansboro. Both the barracks and ammunition magazine collapsed into ashes. In the fall of 1861, North Carolina found its vital defenses at Hatteras Inlet compromised, making the sounds vulnerable to Union naval invasion. Confederate Brigadier General Walter Gwynn, in charge of coastal defenses from New Bern to the South Carolina line, strongly recommended construction of a series of small forts to protect critical inlets. Among those was a six-gun battery at Bogue Inlet on Huggins’ Island, later called Russell’s Island. Construction of the fort was completed in December 1861 and a company of artillery was then stationed at the fort to man the cannons. The company did not remain long at the fort as they were ordered to join General Lawrence O’B. Branch’s brigade at New Bern in March. They took the cannons with them when they marched out of Swansboro. After the fire, only the earthen embankment remained as evidence of the fort’s existence. Those earthworks, however, have somehow dodged development and erosion, and are now a part of Hammocks Beach State Park. Vance’s parole from Washington, D.C.’s Old Capitol Prison. Image from the Library of Congress. On July 5, 1865, ex-Confederate Governor Zebulon Baird Vance was paroled on his honor after imprisonment at the Old Capitol Prison in Washington, D.C.
As the end of the Civil War unfolded in North Carolina, Vance played an important role. Fleeing west in advance of General William T. Sherman’s army, Vance stopped in Greensboro and met with Confederate General Joseph Johnston. When Johnston traveled to Charlotte to meet with Confederate president Jefferson Davis, Vance followed. However, Vance returned to Greensboro after agreeing to have no further obligations to the Confederacy. After relinquishing his ties to the Confederacy, Vance contacted Union General John Schofield and offered to surrender himself. Schofield declined to arrest him, saying he had no orders to do so. Vance informed Schofield that he would return to his home in Statesville. Vance’s stay in Statesville was short-lived. He on May 4 only to be arrested on the orders of General Ulysses S. Grant on May 13. By May 20, he was in Washington. While he was imprisoned, his wife’s health, usually fragile, took a bad turn. Provisional Governor W.W. Holden sent a telegram on July 4 noting her ill health and asking for Vance’s release. After the war, Vance practiced law in Charlotte. By terms of the Fourteenth Amendment he was prevented from taking the U.S. Senate seat to which he was elected in 1870, but he worked behind the scenes to develop the Conservative party until he was eligible for office in 1872. Elected governor again in 1876, Vance vacated that office with two years left in his term in 1879 to join the U.S. Senate. He would serve there until his death in 1894. A reunion of the 35th United States Colored Troops in Plymouth, circa 1905. Image from the State Archives. The organizing and recruiting of North Carolina’s African American troops had already been underway for nine months. In July 1862, Congress issued a Second Confiscation and Militia Act. The act allowed President Abraham Lincoln to use as many African Americans as he deemed necessary to suppress the South, and to use them in whatever way he thought best to accomplish that end. The use and treatment of African Americans varied, and men were frequently assigned fatigue duty rather than combat. However, Lincoln did authorize African Americans to assume combat roles in the January 1863 Emancipation Proclamation. That May, General Orders No. 143 established a Bureau of Colored Troops and all future regiments would be designated as United States Colored Troops. North Carolina units began organization under the Corps D’Afrique designations and as state-named regiments, but entered into service under United States Colored Troops designations. Brown. Image from the Library of Congress. On June 6, 1795, long-time lawmaker Bedford Brown was born in Caswell County. 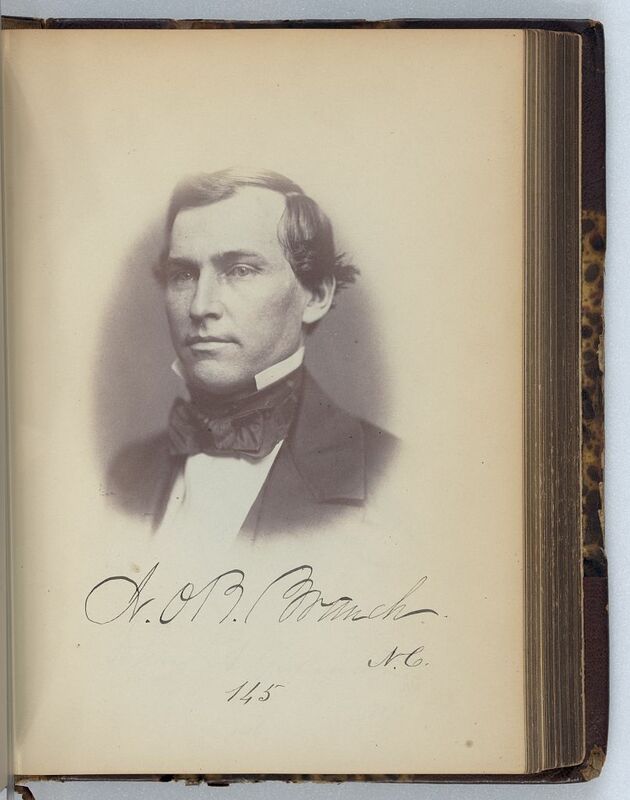 Remembered as a politician who dedicated himself to the preservation of the United States before, during and after the Civil War he feared the most, Brown was elected to the North Carolina House of Commons when he was only 20-years-old. After serving four terms in the House, Brown was elected to the state Senate in 1828, and was chosen as speaker soon after. He was elected to the United States Senate the following year. Brown’s 10-year tenure in Congress ended in 1840, when his Unionist views found him out of favor with the Calhoun Democrats of the South. Brown lived in Missouri and Virginia until returning to his Caswell County home in 1855. Catching a second wind, Brown returned to politics with election to the state Senate in 1858, where he served until 1864. In the fall of 1868, Brown was once again elected to state Senate, but partisan politics prevented his attendance. Known as an ardent Unionist, Brown considered secession “the greatest political calamity that can befall the people of any nation.” Brown died at his home in December 1870, two years after his political career came to an end.